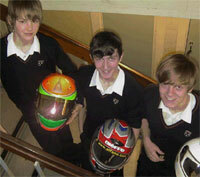 A team of kart drivers from a Northumberland school have sped into the final of a national competition. Ponteland High School pupils Daniel Barber, 16, Christian Harrison, 15, and Matthew Graham, 13, won the regional final of the British School Karting Championship in style last Thursday. The team whizzed to the top of 70 North entries at the Teesside Autodrome, beating teams from as far away as Berwick and Doncaster. Now, they will travel to Milton Keynes to compete in the national final of the contest, which is open to 13 to 18-year-olds. They will face 33 top teams from across the country on a 1360m track, using karts with a top speed of over 60mph. Each driver will tackle two races with the top times winning podium positions for their school. The lads, who are all from Ponteland, put a school team together last year after Daniel found out about the competition. They have quickly made a name for themselves in karting circles. Daniel has been racing at Warden Law near Sunderland for over three years and is currently leading the 2010 Junior TKM class. "It started out as a birthday present, we took him along to the circuit to have a go and that was that," said his father, Tony. "He has a real passion for it, as do the others. "They are very dedicated to their driving, and very excited to have made it to the finals in their first attempt." Christian also races at Warden Law. Matthew races in the Super 1 National Karting Championship, which started last weekend, where karts can reach speeds of 85mph. Last year he won the British Championship at Cadet level. Ponteland High School physics teacher, Phil Armstrong, manages and supports the boys. "This is the first year we have been able to put together a team, and they are doing very well," he said. "They are all very good drivers, and really enjoy taking part in the competition. We're all really looking forward to Milton Keynes." The British School Karting Championship has grown from just a handful of schools in London to almost 200 schools across the country, over three years.